Our campsite has a 1,000 m² heated aquatic park! The whole family will be able to enjoy the benefits of water, with a paddling pool for the little ones, waterslides for older children and a Jacuzzi for the parents! And don't forget our indoor swimming pool, which is a place everyone can enjoy a swim whatever the weather! Older children will love discovering our aquatic games area, which is perfect for cooling off and having fun! The outdoor pools have surrounding areas where you can really enjoy the sunshine, and there is a straw hut for refreshment whilst enjoying the fantastic view over the small valleys of Drôme provençale. Cool off at the river! 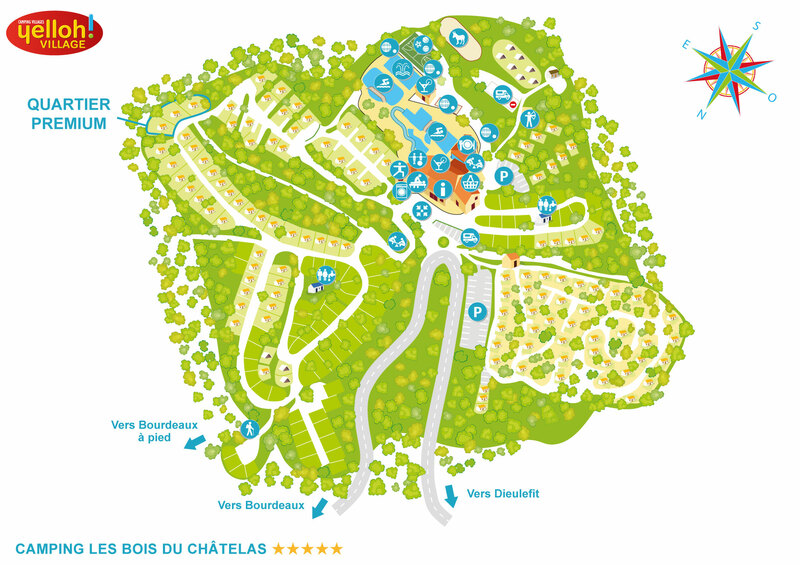 You'll love the cool, fresh water of the Drôme rivers during your camping holiday at Les Bois-du-Châtelas. Not far from the village lies the mint-coloured Roubion, a river which really is perfect for relaxation. The Drôme, which is famous for being a favourite location for all sorts of activities, is the perfect setting for a lovely afternoon of relaxation with the family. With picnics, bathing and canoe trips, your days at the river will be thoroughly reinvigorating!